The median net worth of members of Congress is more than nine times that of the typical American. 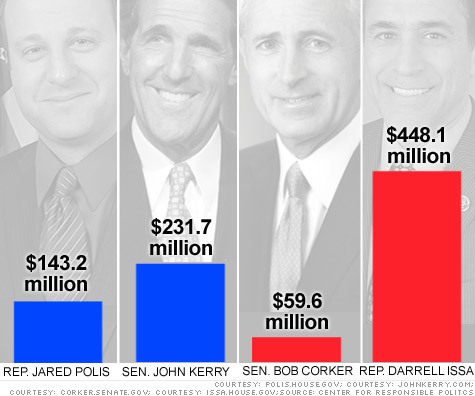 NEW YORK (CNNMoney) -- Members of Congress are much richer than you and me. With a median net worth of $878,500, Democratic lawmakers were actually worth more than nine times the typical American household in 2010. Not bad for the party that positions itself as the defender of the middle class. And 21 congressional Democrats have average assets of more than $10 million, according to the Center for Responsive Politics, which analyzed politicians' financial disclosure forms. Obama's average net worth of $7.3 million isn't too shabby either, especially when compared to the median household net worth in America, which was $96,000 in 2009. Republicans still have the upper hand in terms of wealth, but not by much. Their median net worth was $957,500, and 35 of them have assets totaling more than $10 million. Regardless of party, Congress members' $174,000 salary blows away the median household income of $49,445 for 2010. And their net worth has been on the rise since 2004, unlike ordinary Americans, who have seen their wealth slip. What's more, the center doesn't even include a primary home when calculating net worth for politicians. But the Census, which calculates net worth for average Americans, includes all real estate assets. Members of Congress have long come from the upper echelon of American society. A Rockefeller still roams the halls of Capitol Hill ... Jay of West Virginia with an average net worth of $99 million. He's not the only lawmaker with big money. Senator John Kerry of Massachusetts is the richest Democrat, worth an average of $232 million. His wealth is boosted by his wife, who is an heir to the Heinz ketchup fortune. Senator Mark Warner, a Virginia Democrat worth $193 million, made his money in celluar phones, co-founding the company that became Nextel. California Representative Darrell Issa's fortune is built on vehicle anti-theft devices. The Republican is the richest Congress member by far, with an average net worth of $448 million. His House colleague, Michael McCaul of Texas, is worth $380 million thanks to his wife, whose family runs Clear Channel Communications. "It's very hard for someone of median wealth to serve in Congress, even if they could raise the money to get elected," said Nolan McCarty, a politics professor at Princeton University. Less than 2% of Congress come from the working class, a figure that's stayed constant for the last century, said Nick Carnes, assistant public policy professor at Duke University. Congress is mostly made up of lawyers and business professionals, Carnes said. And as income inequality grows in America, the gap between lawmakers and their constituents widens as well. The wealth divide between politicians and the people takes on particular significance this year, as Democrats and Republicans battle over whether to raise taxes on the wealthy and slash spending on safety net programs. Obama and his party are setting themselves up as advocates for the middle class and their American dreams. "That sense of middle-class security and the notion that successive generations would do better than the previous one -- that felt like it was slipping away for too many people," Obama said at a recent campaign rally. While the wealthy are able to advocate on behalf of the less fortunate, those of more moderate means tend to do a better job of representing the middle and working classes, some experts say. "Politicians from working and middle classes are more likely to work hard on bread and butter domestic economic issues that matter to ordinary Americans," Carnes said.